Things are winding down in the garden in preparation for the fall harvest/winter crop planting season. Now that most of my bean plants have shown their true colors, I put together a list of the Top 10 beans from this year's trial. This is an incredibly vigorous and high yielding pole bean that is currently displaying a large color variance, with everything from a dark brown approaching black to a light tan. I'm hoping to stabilize the color in future seasons. This selection is a pole bean with what I believe to be the highest yield of everything planted this year. (I haven't actually measured yet, because the late-maturing varieties are still producing.) The beans are long and cylindrical, compared to the more typical rounded bean shape, and the color is a range of dark browns. This is a selection from a single plant of Black Small 3 (aka "Caravan") that has brighter purple pods and seeds roughly double the size of the parent. If the yield remains strong, it should be a good variety. This is the result of a manually cross pollinated hybrid of Four Corners Gold (a yellow bean) and Rio Zape (a purple bean with black stripes). The seeds are very large, which is promising. I am looking forward to seeing what kind of variation I will obtain in future generations. I tried to select out the brown (rather than black) seeds, but the colors are so close that they are extremely difficult to distinguish without very good lighting. I was a bit disappointed that this one has a delayed maturity compared to most of my other selections, but it still has strong vines with a decent yield and should be well worth pursuing in future seasons. I like the appearance of this one, though it is a shame that the post-harvest darkening dulls the color as time passes. The yield wasn't spectacular, but not terrible either. This selection has a spectacular deep red seed color and good yield. Each individual pod is surprisingly long. I'm hopeful that it will be a good variety. This is an attractive red bean with slightly darker red stripes. The color is intense. I'm hoping that it will be inherited in future generations. This is a selection from a hybrid between Rio Zape and Purple Podded Pole. It is a slightly late-maturing pole bean that has the best color of all the solid-purple selections that I made this year, though as with the rest of the Rio Zape offspring, it is affected by post-harvest darkening that turns the seed coats brown with time. This cousin of the selection above is a solid white bean. I'm not partial to white beans, but I know a lot of people are, and now that I have purchased several cookbooks dedicated to bean recipes, I may find some good uses for them. It seems like a good idea to keep my options open. In other news, my cousin visited the area over the weekend to receive an award from the Sierra Club. I was able to meet him at the airport on Friday and have supper together in the city. That was a nice excursion. On the job front, Management has decided to try a new tactic. If you recall, they first attempted to change our schedules to create a new graveyard shift, but we've been fighting that with the union. Then we proposed a temporary experimental schedule to gather data on the performance of their desired shift, but they didn't want to agree to our proposal. This week they have started drafting handlers to cover the late-night hours as overtime rather than as a fixed shift. There really isn't anything we can do about this, because they have the authority to draft people for as much overtime as they feel necessary, as long as they have the budget for it. On the bright side, now they're paying us $90/hour to obtain statistical data on these work hours, which we can then use to support our position, so I guess it's not a total loss. WOW. $90/hour is some serious money. How many hours a week are they drafting people for? What a pain to have to work a graveyard shift into a normal work schedule. 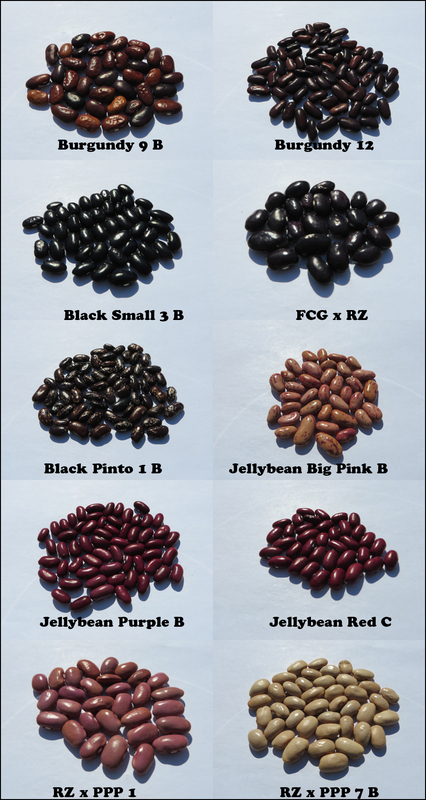 Are your top ten beans just based on yield and color? How many hours a week are they drafting people for? They just started on Friday, so I can't be sure about their overall plan. A typical draft is 4-6 hours per night worked, depending on what time the handler's shift was supposed to have ended. It's a combination of yield, color, and maturity date. I give preference to early maturing selections, because beans that don't mature until October run the risk of turning moldy in the fall rains (assuming the drought breaks). #1 and #2 on the list produced sufficiently that I should be able to run a taste test on them sometime this winter (after I have the final yield data recorded). Then I can incorporate those results as well. they have started drafting handlers to cover the late-night hours as overtime rather than as a fixed shift. I'm still sympathetic to management's desire to have maximum flight coverage, but this move just seems petty and punitive. It's such an obvious loophole, I would think the union would be prepared to do something about it. On the plus side, the OT budget can't be limitless and you are getting the data to make a stronger case for no graveyard shift. Are there limits on the overtime each individual employee can be asked to do in a week? 1. The same person can't be drafted two days in a row. 2. A person must be allowed at least 8 hours between ending work and beginning the next day's shift, which means a person can't be drafted to work until 2am if they have to start work again at 7am. Mainly flavor. When I cook beans, 80% of the time it's Mexican style with strong spices, and 20% of the time it's in Indian curry...again with strong spices. I've found that white beans (and often yellow beans) just aren't rich enough to pull their own weight in that context. Brown, purple, and red fare better. That's why having the bean specialty cookbooks makes a difference. If I ever cooked them some other way, white beans might have a decent chance. For example, they might go really well in a sweet recipe (in the Japanese bean-paste style). I won't know unless I try. That makes a ton of sense. I like white, yellow, and especially green dried beans, but I use them in things like Italian broth soups, or Chinese porridges which classically uses green dried beans, both of which are fairly bland to begin with. I agree that they don't stand up to the stronger flavors.